WATER LESS® – Mountain Power, Inc.
WATER LESS provides solid performance, reduces expenses, and eliminates the need for a special charger. When packaged with a comprehensive maintenance plan, WATER LESS can help get you out of the maintenance business. Concerned about maintenance expenses? The WATER LESS battery is our preferred solution for customers looking to reduce watering problems and expenses without sacrificing run time or cycle life. Requiring watering just 4 to 6 times per year* in normal applications, WATER LESS combines the benefit of full power and reduced cost. Valve-regulated (‘sealed’) products, while being environmentally friendly, can cost you extra dollars in terms of lost capacity, reduced cycle life, and higher initial cost. They also require a special charger. WATER LESS on the other hand can reduce maintenance expenses by 90% or more while maintaining full capacity and long cycle life. The WATER LESS battery does not require a special charger. When compared to a standard battery, WATER LESS saves you time and money. Less watering, less labor, and less room for watering error. 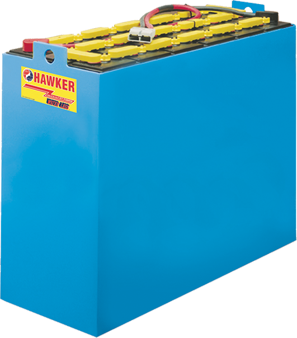 By using proprietary grid metallurgy, special water-saving sleeve separator material, and vent caps designed to minimize water loss, the HAWKERWATER LESS battery requires watering 4 to 6 times per year. * Less watering. Less room for error. If for some reason the battery is watered before the scheduled interval, the battery’s performance will not be affected. When tied to a preventative maintenance program, WATER LESS can become “maintenance free” without the drawbacks. No need to sacrifice performance for reduced maintenance. WATER LESS provides the full performance of a flooded battery. Full Capacity – The WATER LESS battery offers full 85, 100, and 125 AH capacities. Long Life – The WATER LESS battery maintains an estimated cycle life of 1500-2000 cycles, based on one cycle per day and 80% DOD. Application – The WATER LESS battery can be used in medium and heavy applications. Let’s compare the WATER LESS battery to both standard flooded batteries and to valve-regulated batteries. If you’re concerned about the Annual Cost of Ownership (watering and maintenance expenses as well as the initial investment cost), the WATER LESS battery is the clear choice. Compared to standard flooded batteries, WATER LESS saves you time and money. Watering only 4 to 6 times per year,* instead of weekly, can save 90% or more of your watering expense. And less watering means fewer problems caused by over/under watering. Compared to valve-regulated batteries, WATER LESS is not only more economical to own, but also delivers more capacity and longer life. No Special Charger – May be charged on a standard charger; no special requirements or special charger needed. Maintenance Plan – WATER LESS can help get you out of the maintenance business. 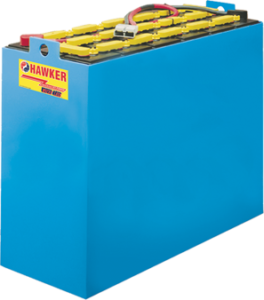 Your HAWKER dealer can set up a comprehensive, programmed maintenance agreement including watering your batteries. This offers you a “no maintenance” battery option. * Based on one cycle per day and 80% DOD.